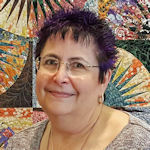 Cindy has been quilting since the early 80’s, has been teaching quilting for over 12 years. She specializes in paper piecing using Quiltworx.com patterns. Cindy’s other interests include beading, jewelry making and knitting, especially lace knitting. Cindy lives and plays in Southern California. She owns and operates an Adult Residential Facility in her home in Ontario, CA, where she, along with her husband and daughter, care for four developmentally disabled men. Cindy does custom machine quilting and makes custom quilts on commission. She shares studio space with her family’s three cats, Lilly, Missy and Zoe, who love to inspect all the quilts that come into her studio.